Lately, it has been quite difficult to keep on top of our travel diary, I must confess. We are currently in the UK and I have started work on my new venture, which takes up a lot of my time. It is all very exciting though and I will share more in the future. But I do not want to neglect our travel diary – it is important to me to tell our travel tales and share our photographs of the amazing places we were lucky enough to visit this year. After seeing the amazing temples of Angkor near Siem Reap in Cambodia, we hopped on 2 x three hour flights and we finally arrived in Bali! I was so excited, I had been waiting for so long to finally get here. And we made it just in time for my birthday 🙂 I could have only hoped that we will be in Bali in time for my birthday and I can’t believe how it actually worked out that way. So now we were halfway through our South East Asian adventure and we were here for a well-earned break. Many would of course argue – what did you need a break from? You had been travelling in the most amazing places for the past two months after all! I completely agree, and 2 months before I would have wondered the exact same thing. How can you get tired of travelling? And we did not get tired of it, that’s for sure, but we did get tired. Let me tell you, travelling – is tiring. Being constantly on the road, living out of a backpack, never knowing where you will end up the following day, where you will sleep, what you will eat, how will you get your clothes washed… But at the same time that is exactly what is so exhilarating about it! Nevertheless, let’s face it! Neither of us were teenagers anymore, heck we’re not even full-of-energy twenty-somethings! We are thirty-somethings who get tired easily AND we’re proud!! 😀 I could not wait to spend the next two weeks on the beach!! Even before we had set off on our travels I had found this bar online that I wanted to make sure we visit while in Bali. So we decided to go there for my birthday. It is called Potato Head Beach Club and it is in Seminyak. I wanted to visit because I loved the look of it! The design of it is really cool, it is a curved shape bar with the outer wall covered in different coloured window shutters! Because of its hip design and its location right on the beach it seemed like it is THE place to be on a night out in Seminyak, especially around sunset. The place was rammed! We started talking to one of the waiters who told us that the most coveted seats, tables and sun-loungers by the beach with the best views over the sunset can have a waiting list of several days. We had some cocktails, watched the sunset, then moved down to the beach and watch some dramatic rain-clouds roll in in the semi-darkness. What can I tell you about Seminyak otherwise? Well, we spent 5 days in Seminyak and the 5 days in Kuta. 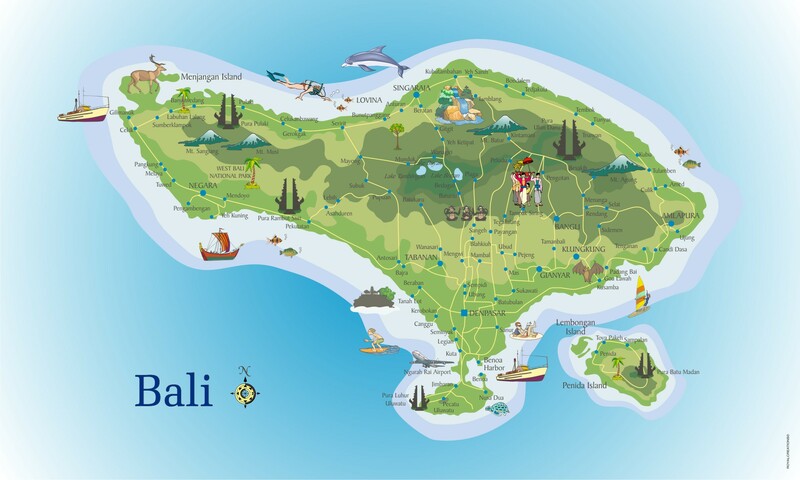 These two beaches / resorts are the most well known parts of Bali island. Honestly, I would probably trade in at least half of the time we spent in Seminyak / Kuta, for other parts of Bali. When you have never been to somewhere and try to decide where the best place to go is, these days you are most likely to do a bit of research online. Where are the cool bars and restaurants? Where can I go to learn surfing? Where can I see nice sunsets and have a nice beach holiday? Almost everywhere Kuta and Seminyak would be the choice for tourists. Especially Australian tourists. And so this is where we went first. While it is true that Kuta is a beginner surfers paradise, it is unfortunately also true that if you are looking for Bali’s famous culture, spirituality, religion and its gorgeous people, Kuta is not the place to be, trust me on this. Here is another blog post that you might want to read. Now I’m not saying I agree with everything in this article, but it is closer to the truth than Kuta is to what Bali is really about.